Recipero provide solutions to a variety of sectors and customers. Those solutions deliver real-time intelligence tailored to each industry and client to support critical decision-making processes. For example our CheckMEND service is provided in several ways. For small retailers or recyclers we provide a web-interface. For multi-outlet retailers and larger recommerce businesses we integrate directly with their systems via an Application Interface (API). Speed is critical in those environments. For insurers our ClaimsCheck claim validation service has been developed in conjunction with insurers and optimises results and return on investment. Our corporate customers include household names such as Carphone Warehouse, Mazuma, Vodafone, Aviva and GameStop. These larger businesses often require enhanced solutions. We work closely with in-house teams to integrate with existing systems and processes to enhance the overall effectiveness of solution and returns. Learn more about how we help customers on our case studies page. 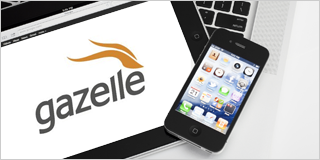 Gazelle have always been at the forefront of customer service provision and were the first online recommerce company in the US to deploy CheckMEND, enhancing their ability to spot stolen goods and increasing customer protection. GameStop are the world’s largest multichannel videogame retailer. In the US it has over 4,200 stores all of which have an active smartphone trade-in program that benefits from Recipero's customized due-diligence solutions. Launched in 2004, the NMPR solution Recipero provide to law enforcement is a real-time intelligence solution delivering many benefits including crime investigation, property repatriation, and significant resource savings.